This series of posts highlights some of our local industry talent – on-screen and behind-the-scenes, established and up-and-coming. Back in August, Utah hit a new record with the release of three (!) made-in-state productions: Wind River, Brigsby Bear and We Love You, Sally Carmichael. All three received support from the Motion Picture Incentive Program and went on to shoot in multiple counties across the state, creating nearly 500 jobs and generating an economic impact of $7.5 million in Utah cities. As a result of the films’ release, Utah and its talented film industry were showcased in over 2,500 theaters around the country – not to mention the many screenings internationally. We wanted to take the opportunity to introduce some of these local industry stars, and will do so over a series of ‘spotlight’ posts. 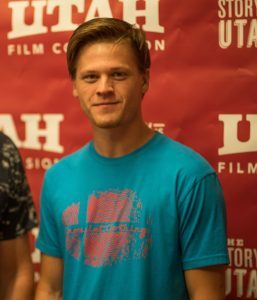 Austin Grant, pictured above on the set of Wind River, and below at a recent cast and crew screening, is an up-and-coming actor from Salt Lake. Having performed in several feature films, commercials and on stage, Austin has worked with the likes of Jeremy Renner, Elizabeth Olsen and Josh Hartnett, as well as the Oscar-nominated director Taylor Sheridan and the notable Scott Waugh. Austin was cast in Academy-nominated Wind River and has since filmed for You Tube Red’s Youth & Consequences and the much-anticipated Paramount series, Yellowstone, starring Kevin Costner. Austin is also working on a project of his own, a short film, with inspiration taken from the great Sweeney Todd, The Phantom of the Opera and Downton Abbey. We spoke to Austin about his experience to date [check out the below Q&A], and we are hopeful that this is just the beginning of a successful career for this made-in-Utah star. No, I didn’t, but I have always been a fan of movies and story-telling in general. My family has always loved to watch movies. I’ve always been imaginative. How did you initially get into the film industry? I actually got into acting as a complete joke in high school. I thought it would be funny if I was cast in the school play, so I auditioned and ended up landing a lead role and just went from there. I took some acting classes and workshops for about a year straight and then auditioned for McCarty Talent Agency, who became my agent. From there, I’ve just done anything to stay busy – doing theatre or short films in between paying gigs. I’m incredibly grateful to have been born in Utah. I love it here. Personally, I think Utah is one of the best places to start an acting career. There’s enough work to build up a great resume and gain SAG eligibility. Tell us about working with the likes of filmmaker Taylor Sheridan and actors Jeremy Renner and Elizabeth Olsen on feature film Wind River? Let me just say, working on Wind River feels like winning the lottery in some ways. I remember distinctly when Sicario [written by Taylor Sheridan] came out because I went to see the movie by myself while it was still in theaters. I LOVED the film. And if you were to tell me at that time that I would be working with its writer, along with Jeremy Renner and Elizabeth Olsen, the following year, I honestly wouldn’t have believed you [laughs]. Granted, I play a very small part in Wind River, but just working on that movie has opened so many doors. I’ve worked with a handful of ‘big names’ now and luckily, all of them have been super cool and have given me many pointers along the way. I always start where every actor starts: reading the script. I like to read it, and read it, and read it again – as many times as I can, so that I really know the story. At the end of the day, that’s what the whole thing is about: telling a story. I like to work very physically. I’ve come to realize over the years that emotions really are within the body and not the mind. I do various exercises to help ground the dialogue and stretch it. I think everything you need to know is within the text. The best part is figuring out what is not said by the characters in a scene. How much of a Utah presence did you feel on the set of Wind River (in terms of the locations, cast and crew)? It definitely felt like winter in Utah when we were filming Wind River. I filmed for a little over one week, and like most people who live here, I know how bipolar the weather can be. The first day I filmed, it was 50 degrees (which feels like paradise in the winter) and I had to ‘act’ like it was cold. The rest of my shoot days were much colder. You know it’s winter when you get snowmobiled up to set! There was a big Utah presence on set, with a lot of Utah crew. I had worked with a couple of them before and, with it being a tight-knit community, we always seem run into each other on another set at some point. Can you tell us a funny experience that you had on one of your recent film sets? I definitely had an interesting experience while recently filming a TV series in Ogden. The character I’m playing is dressed up in drag for one scene. After some filming, we broke for lunch at a nearby hotel. A PA [production assistant] and I walked over to the hotel and passed a bar on the way. Keep in mind, I’m still in my drag costume. A guy, who was clearly drunk, began to ‘cat call’ me as I crossed the street. As I recall, he said something to the sort of “One, two, step, pop. One, two, step, pop!” So, I now have a small taste of what it’s like to be cat-called. There’s an awesome British movie called Velvet Goldmine , with Jonathan Rhys Meyers, Ewan McGregor, Christian Bale and Toni Collette, that I consider to be a hidden gem. Meyers plays a David Bowie-inspired character and McGregor plays an Iggy Pop-inspired character. I don’t know why, but after seeing their performances in that, I really want to play a rockstar-style character [laughs]. It just seems like it would be so fun because rockstars tend to be larger than life characters. You can be creative and take a character like that in any direction that you want. I would also LOVE to play a historical figure at some point. If you could act alongside any actor/actress, who would it be? That list might be too long [laughs]. I would say Daniel Day-Lewis, but I might forget my lines alongside him because he’s too good! Tom Hardy is one of my favorite actors. Michael Fassbender. Ryan Gosling. Gary Oldman. Michelle Williams. Rooney Mara. DiCaprio. I would have also loved to work with Heath Ledger. The Sandlot is my favorite movie. I still wear PF Flyers because Benny the Jet Rodriguez wore them in that movie. They make you run faster and jump higher. What advice would you give to an aspiring actor/actress in Utah? Anyone who is considering trying to act or who may have already started but is early on, I would say to keep your head down and ignore those who are telling you that it’s impossible or just a hobby, because it’s not. It can be, which is totally fine, but I know there’s a lot of people who are serious about this, just as I am. At one point, I was just rambling off sides at my first audition in high school. I had no idea what I was doing. I still don’t… [laughs]. Acting is a craft like anything else. It’s something that can never be perfected. In fact, “good” acting doesn’t even exist; there’s only truthful acting. The second you try to be “good” is the second that you’re not. It’s all about letting go and simply meaning what you say. I just read an article on Joaquin Phoenix (another one of my favorite actors) and he had a fantastic quote, which I think says it perfectly: “bad acting is being self-conscious”. You have to FULLY believe you are in the world of the script, and you are a real person who is going through something. Also, it’s important to have fun; sometimes we forget that acting is fun. Hell, we put on makeup and play pretend for a living. Made in Utah: "Three O’Clock High"